When you name your debut album Adventures in Technicolour then you’d better make sure it lives up its name. First off, it needs to feel like a thrilling experience, and secondly it has to be vibrant and vivid. So do Imperial and K.I.N.E.T.I.K. deliver? Imperial comes first in the billing so let’s address the production to begin with. Although most would consider lyrics to be the most essential part of a rap album, many of us get nowhere near to hearing them if the beat doesn’t hit. A weak first few bars of music and listeners will be skipping forwards – no-one has time to waste on boring production. There is not a track on this album with an uninspiring beat – all killer no filler is rarely ever achieved where production is concerned, but Imperial really has nailed it here. Aside from the laid-back jazz vibes of ‘Travel the Map’ (which features none other than Oddisee) and the melancholy sounds of the Praverb the Wyse tribute ‘Golden Crown’ (featuring Elias) every track is laden with what can only be described as pure funk. Imperial has turned up the drums (seriously, warn your ears) and amped up the bass and the supporting cast of squealing southern-sounding organs (‘Just Another Day’), pianos (‘Higher’) and flutes (‘The Great Indoors’) ensure that every track is full of rich sound. But it’s the west coast-style synths (too many tracks to name), along with the booming drums, that weave a cohesive thread throughout the album without Imperial coming off as some second-rate Dre. Even on tracks where K.I.N.E.T.I.K. discusses emotive issues (‘One Big Rhyme’ and ‘Man of the House’) the production sound remains positive making thought-provoking rhymes easily palatable for the listener. The optimism of this project oozes through the beats – it’ll make an excellent summer album: most of it sounds like windows-down cruising or pool side relaxation. The affable K.I.N.E.T.I.K. strides confidently over Imperial’s groundwork, riding rhythms with aplomb with his carefully-crafted rhymes. Despite the fact that this album is on US label Illect Recordings, K.I.N.E.T.I.K. never feels like he has to compromise on his Englishness, something which can’t be said for all UK rappers associated with US labels. K.I.N.E.T.I.K. opens Adventures in Technicolour by taking the listener into his confidence on ‘One Big Rhyme’ as he opens up about the trials and tribulations of the last few years. As the album continues you realise it was a powerful way to start as you get the overwhelming feeling that despite the problems K.I.N.E.T.I.K. remains resolutely joyful and optimistic (“I’m more than happy with the place and time I find that I’m in, I see a bright horizon because my eyes are widened… I count it all joy like the line from the Winans.”). There are hints at how his beliefs have helped him through trying times (“my faith initiates a steady rise, then mentally I’m in the heavenlies…”) and whilst faith is not an explicit theme it is one of the colours that makes this album so bright. There is real variety in subject matter with tracks like ‘Just Another Day’ and ‘The Great Indoors’ being light in tone although the latter track still carries a message. ‘Fix Your Face’ is a fun excursion which cheekily lampoons miserable-looking people – K.I.N.E.T.I.K. kind of has a point, too! ‘Hold That’ is unique to the UK version but it’s really worth a mention – it goes hard and features on of the UK’s finest wordsmiths Micall Parknsun. The album wraps up with ‘Not For Sale’ (“Integrity over everything”) which is preceded by a hilarious skit which so concisely sums up the greedy world that Imperial and K.I.N.E.T.I.K. have so implicitly distanced themselves from on this album and it leaves the listener with something serious to meditate on. The sunny optimism of this album keeps the listener fully entertained whilst plenty of serious and thought-provoking subject matter is sneaked past their ears. Despite the positivity and happiness of this album it definitely isn’t head-in-the-sand bubblegum. Supremely-crafted beats combine with a broad palette of colourful subjects, enough to satisfy even the most intrepid listener. 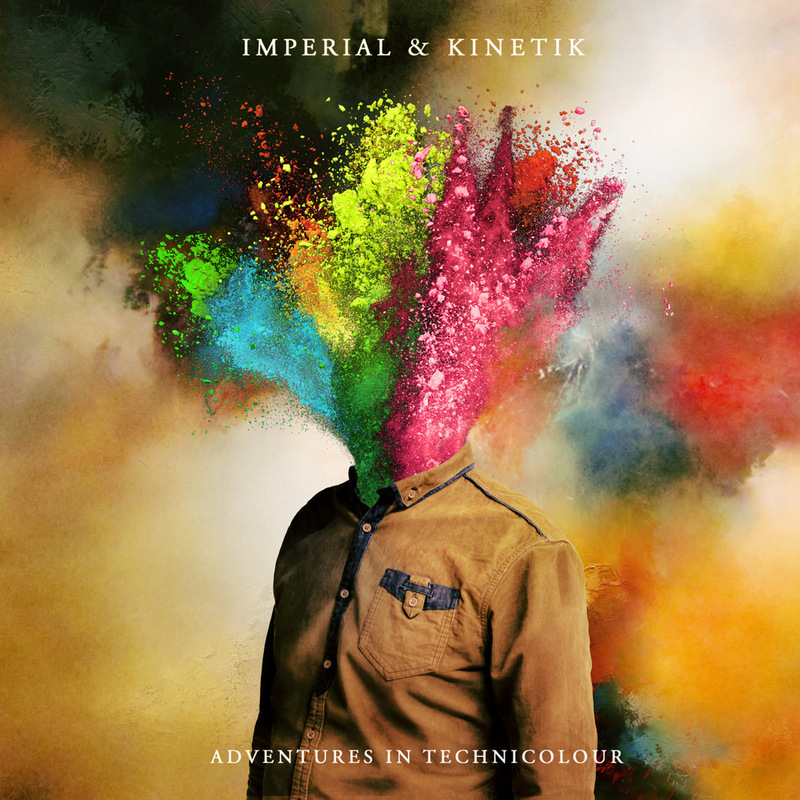 Adventures in Technicolour is available at all digital retailers via Illect Recordings. Pick it up at iTunes, IllectDirect.com and SphereofhiphopStore.com. Thanks for the review. I have been pleasantly surprised by the album. Ever since I got it I haven’t been able to put it down! Production is on point, and the subject matter covers a spectrum of topics. Glad to support! Thanks again. Glad you’re digging it Matt!